or directly from Texture Press. After a terrible mix-up with a paintball gun and a backpack leading to fears of school violence, 15-year-old Kithie is asked to head up a Good Deeds Society at her school. She teams up with her 10-year-old brother, a computer genius with video games and ringtones. In the meantime, Kithie tries to solve the mystery of what happened to Gus’s dad, and who is stalking her mom, the former child star of a tv show featuring a family of vampires. A pop star dogged by tabloids, a tarantula-loving soccer star, a frisky hamster, and an unusual principal figure into the mix. In the meantime, Kithie confronts her own sense of loss and the chaos that is her family. Find out about the Good Deeds: Focus on Earth Sister Schools program with Slovenian schools at www.gooddeedssociety.com. 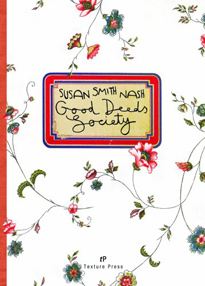 Susan Smith Nash examines poetics and the convergences of text, media, and culture in recent articles published in Big Bridge, Gargoyle, Talisman, Golden Handcuffs Review, and World Literature Today. She functions as managing editor for Texture Press, and maintains an edublog, www.elearningqueen.com where she is assistant to the faithful Corgi, the Queen. Her column, “The Psychic Sponge’s Guide to Zeitgeistland” is a regular feature on Press 1. She lives in Norman, Oklahoma.